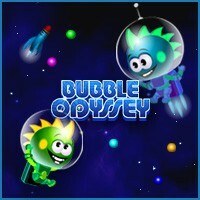 A truly captivating bubble-bursting exploration awaits you in Bubble Odyssey! Three extraordinary and super-addictive game types with 70 exciting levels each, numerous explosive power-ups and tons of unique bonuses will bring you the non-stop puzzle action you have always dreamed of! So come along with two out-of-this-world dragons on their perilous journey!